The purpose of this website is to provide interesting and useful facts about Africa. This information includes such topics as the people of Africa, African landforms, African art history, African animals, African jewelry, African culture, and African clothing. On the pages of this site you will discover what animals live in Africa, where Africa's longest river is, who some of the most famous African people are, and how African art influenced many famous artists from other countries. 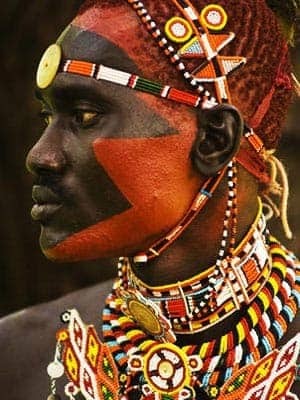 Africa is the most interesting and diverse continent on the earth. It is the home of an incredible variety of people, animals, climates, and spectacular places. It is a country known for its beautiful colorful clothing and its history of incredible works of art. Africa is where human beings first appeared on earth and the home of the world's first great civilization, Egypt which dates to 3300 BC. Below you will find lists of interesting facts about Africa. This information is written for both kids and adults. Well over one thousand languages are spoken by the people of Africa. Some estimates put this number closer to two thousand. The African population is approximately 14.72% of the world's population (as of 2009). Africa has the world's largest desert, the Sahara, which is almost the size of the United States. Victoria Falls is the largest waterfall in Africa; it is 355 feet high and one mile wide. Madagascar is the largest island in Africa and the fourth largest island in the world. It is in the Indian Ocean off the East coast of Africa. A plateau called Witwatersrand in South Africa has produced half of the gold ever mined on Earth. Africa is the second largest continent on earth, approximately 11.7 million square miles. Cairo is the continents largest city. Long before humans were around (the early Mesozoic Era) Africa was joined to the other continents in a massive continent called Pangaea. Over millions of years this huge continent broke apart shaping the world landscape as we know it today. It is widely believed the African continent got its name from the ancient Romans. Upon defeating the ancient northern African city of Carthage, the Romans founded a province there they named Africa; named after the Afri tribe that inhabited the area. Dallol in Northern Ethiopia has the world's hottest average temperature. The average temperature in this locality is 93 degrees Fahrenheit (33.89 degrees Celsius). Africa is full of dangerous animals that account for thousands of human deaths per year. Mosquitos which can transmit numerous dangerous diseases such as malaria kill the most people. Other deadly animals include the hippopotamus, the deadliest mammal, and the Puff Adder, the most dangerous snake. The gorilla, which can be found in the continents jungles, is the worlds largest primate. The world's largest frog, the goliath frog (also called the goliath bullfrog) lives in Africa. They can be found in the central African countries of Cameroon and Equatorial Guinea. They can grow to lengths of over 1 foot (30.5 centimeters). Twenty five percent of the earth's bird species live in Africa. Explore the pages of this site to discover more about the amazing African continent.